On October 27th, 2017 the CFA Investment Summit, a key event for financial market participants in Poland, took place at the Warsaw Stock Exchange. The event was organized by CFA Society Poland. The main media partner was the newspaper “Puls Biznesu“. The conference was divided into a series of lectures and panel sessions with the participation of nearly 250 experts from Poland and abroad. This year’s event began with the presentation of the results of a survey commissioned by CFA Society Poland. The survey was run on a sample of more than 500 financial professionals and its subject was knowledge of fintech issues. Its results indicate that, when asked about their knowledge of the use of new technology in the financial industry, only 31% of respondents responded that it was very good or good. The vast majority of respondents (40%) said that they were “neither well nor poorly” acquainted with the topic. In the first part of the conference, the speakers focused on what the opportunities and risks the fintech revolution presents, especially for companies and managers dealing with traditional investment advice. – According to a survey conducted among top experts, they absolutely do not see the threat. Almost 80% think that fintech is not a problem for them, because they are good enough that when conditions change they will adjust and win. On the other hand, for less developed professions that do not require creativity, it is indeed a threat, because these professions will disappear. The ones which stay will be specializations that require creativity, an analytical approach and communication skills – explains Krzysztof Jajuga, President of CFA Society Poland. –There is space for a whole spectrum of advisors on the market – from traditional to fully automated models. Today, in a rapidly changing world, it is hard to predict how the accents will be distributed. Since now 1 percent of the population uses financial advisory services, there is a problem with supply/the problem lies with the supply, because it pays off for advisors to advise only the richest . This is the space for automated consultancy. The founder of Empirica believes that the entrance of the generation of millennials in the market, increasingly eager to use AI-based (artificial intelligence) solutions, will especially be the impetus for the development of fully automated advisory platforms, which, using a well-tailored user interface, will allow customers with lesser resources to engage more on the investment market. Which, he added, should lead to its greater democratization. http://empirica-software.com/wp-content/uploads/sites/8/2017/11/CFA-Investment-Summit01-1.jpeg 685 1028 jakubjarosz http://empirica-software.com/wp-content/uploads/sites/8/2019/02/Logo_empirica_software-for-financial-markets_final_big.png jakubjarosz2017-11-09 15:35:472017-11-30 14:40:49Michał Różański, CEO of Empirica, was among keynote speakers at the CFA Investment Summit in Warsaw. The exploration of Blockchain applications in the securities Industry has already begun and seems possible to pick up steam in the next several years. Many financial institutions have created in-house teams and study labs to construct and examine Blockchain networks, or are working together with third party sellers specializing in this space. In addition, companies have sought to participate in collaborative efforts with consortia to develop a frequent Blockchain frame and make industry standards. The used cases of Blockchain applications are between the equity, debt and derivative markets. Since the implementation of these Blockchain applications advances, issues are being raised concerning how processes involving Blockchain fit within the present regulatory framework. In light of the trends, this section highlights some key factors linked to Blockchain execution and regulation. Developing Blockchain applications in the securities Industry can present many challenges. In trying to overcome those challenges, some of the essential considerations for market participants in executing a Blockchain network may consist of governance, operational architecture and community security. One of the key governance principles of the Bitcoin Network Was to establish a “trustless” environment open to the general public, where no single party is responsible for, or enabled with, governing and operating the network. Although this kind of network may offer certain advantages like providing a decentralized system which isn’t dependent on any particular party to operate, it may also pose some vulnerability in case it contributes to inefficient management of the machine. As an instance, recent events have shown that lack of a central governing body for its evolving Bitcoin Network has generated concerns for the system, as participants try to ascertain an approach to handle greater transaction volume. Therefore, a Blockchain network dependent on the use of a trustless system, where no party is responsible or liable for the appropriate operation of the machine, may pose risks to investors and markets. Many market participants are working to use private Blockchain networks using a governance structure that takes into consideration that participants in the network are generally known and trusted parties. When setting up or engaging in a private Blockchain Network, in which multiple organizations across the sector are involved, a number of the first governance questions that need to be answered relate to the operation of the network and deciding that bears responsibility for it. Below are the types of questions that market participants may wish to consider when creating a governance structure to get a Blockchain network. · Can the governance arrangement for the Blockchain system be determined by a single entity or a set of firms? How would the pursuits of end-users, that aren’t participants on the community, be represented? · Who would be responsible for ensuring adherence by amateurs to the prerequisites established for the Blockchain network, and how could this be ran? · Who would be accountable for the day-to-day operation of this system and resolving any technical problems on the network? · Who would be responsible for setting and maintaining a affordable business continuity plan (BCP) to your network, to address some unanticipated emergencies or significant business disruptions? · How would any conflicts of interest in the performance of or participation on the community be addressed? · How would mistakes or omissions about the Blockchain be mirrored or rectified? A Vital concern for market participants in executing a Blockchain system is discovering the operational structure of the network. The operational structure of a Blockchain system would normally include creating a framework for: (1) network participant access and related on-boarding and off-boarding processes; (2) trade validation; (3) asset representation; and (4) data and transparency demands. Following are a few locations that market participants may want to consider when creating such a framework. · Determine which sort of access would be given to regulators. As previously described different kinds of methodologies before launching a transaction identification methodology, network operators are most likely to evaluate the advantages and disadvantages of each methodology. In doing this analysis, some prospective questions network operators might desire to consider are mentioned below. · If consensus-based, would it take a proof-of-concept or would it be an easy consensus algorithm? How much latency and sophistication would that add to the validation process? What is the risk of collusion by multiple parties to validate a fraudulent transaction? · In case single-node verifier (i.e., one single node will be responsible for confirming all transactions), how would that verifier be determined? Is the simplicity and speed of a single-node verifier value the concentration of risk? What would be the backup or recovery process in the event the single-node is unavailable or endangered? · How would the amount of nodes needed for verification be determined? If other nodes or arbitrary nodes are put up as verifiers, how could the order be established? Does this procedure expose the network to possible dangers from a number of nodes? · What procedure will the system embrace to rectify or correct any erroneous entry that may be recorded on the shared ledgers? To the extent an asset is represented on a Blockchain network, Operators will need to determine how those assets will be based on the community. Following are a few factors operators may want to take into account in the investigation. Will assets be directly issued and digitally represented on The system? Or would they be issued in traditional form and subsequently tokenized on the community? Would the network consider both kinds of asset representation? • If tokenized, what extra security dangers and complexities are posed? How would any loss or theft of the conventional off-chain advantage be managed? How would asset fluctuations (e.g., stock splits and conversions) be handled? • Will the network only permit new advantage issuance or can it allow on-boarding of present assets? • If cash-backed settlement tokens are utilized, would these tokens be termed as virtual money? Could there likely be a scenario where multiple such native tokens are made by various networks or companies? In that case, are they tradable? • If fiat money (i.e., money that’s created by the authorities of a country to be utilized as cash) is used and settlement happens off the system through a conventional cash payment process, how, when, and from whom will the trade and asset transfer be recorded on the network? • How will a participant’s ability to fulfill the money obligation be determined? Can a deposit be accumulated from network participants to be utilised in the event of non-payment? How will this type of deposit be calculated? Read more about Blockchain based capital market systems here. An ICO is a form of financing commonly known as ‘token sales’ That is particularly favourable for early-stage companies. These forthcoming business concepts are valued via artificially created currencies that, theoretically, can be quantified in terms of riches in the long run — when the thought starts making money. There’s not anything more than a guarantee that the business in question has a renewable future beforehand — no feasibility studies are undertaken. Nevertheless, investors are jumping on this bandwagon in great amounts, providing this tendency increasing momentum. Gnosis, the decentralized prediction marketplace platform, increased Over $12.5 million at a Dutch token offering in just 15 minutes. Investors rushed to obtain Gnosis tokens (worth 250,000 Ether), which subsequently had the project valued at a whopping $300 million almost immediately. Money has been set down, not for the final product, but for a forecast, which was sufficient to kick-start the plan. It has amassed over $1.3 billion to date this season for tech start-ups. In fact, in a number of the offerings, demand surpassed the amount of tokens available. Start-ups interested in an ICO may create their own Cryptocurrency utilizing protocols such as Ethereum, Counterparty, or Openledger, and establish a value dependent on the amount of money a job is required to deliver to achieve the roadmap outlined in its whitepaper. This post is like a mini pattern that summarizes the project (what it’s about, what its objectives are, its conclusion milestones, the amount of funds required, the duration of the campaign, and the kind of money okay), providing a prospectus into the market to create interest. The secret is getting the people to like and believe in the thought, even though nothing yet exists in real form to show its feasibility or potential prospects. People worldwide are then able to buy the newly made tokens in exchange for established cryptocurrencies, such as Ether (ETH) or Bitcoins (BTC). Interested investors may open their accounts on electronic currency exchange platforms and begin trading BTC and ETH for a variety of tokens for new projects. ICOs normally persist for a week or so, during which the price of the token fluctuates according to the arrangement set up from the issuers. For instance, the price can remain static to achieve a specific goal or financing goal for your undertaking. However, issuers might want to match the static provide with dynamic pricing, where the price of tokens increases in tandem with the amount of financing received. A third model might have a static cost set with a dynamic supply — for instance, where the worth of ETH 1 is set upon the inception of a token. This will continue until the startup reaches its funding target. Read more about Blockchain and how can it change our lives. ICOs can involve multiple rounds of fundraising, together with the this incentives investors to place their money in as early as possible to reap the maximum benefit. Tokens do not give investors any ownership rights or asset claims. Rather, they behave as bearer instruments, providing users rights about the particular project itself, not to the company that’s launching the project. While owning the tokens doesn’t entitle their holders to vote on the direction of this job, these rights are embedded within the ICO itself, in which engaging investors give input throughout the project’s lifespan. Users may be paid for a right prediction or to receive the content they contribute through a proposal. Investors get involved in these types of actions in anticipation that the value of tokens belonging to successful projects will grow drastically, generating a greater yield on their investments. There’s no doubt that ICOs have become highly popular, not Just with fintech start-ups, but with individuals from all walks of life. They look ideal for anybody who would like to raise capital quickly for an idea. There are a variety of motives for this. Mainly, it is the speed at which money could be raised to get a project that exists solely as a vision — that in contrast to VC financing, where shareholders will run greater examination on the direction dynamics, market size, potential dangers etc.. The simple fact that this is largely an unregulated field also make ICOs attractive in terms of there being few or no duties and costs for compliance. For example, ICOs provide their issuers with numerous rounds of fundraising, with few (if any) intermediaries. These token earnings are likewise not subject to direct taxation, with shareholders being liable to cover only capital gains taxation, depending upon the jurisdiction. What makes this process much more appealing is the ease with which cryptocurrency tokens can be made, used in trades, and traded thanks to technological growth. Issuers might no longer need to mine with complicated codes to use this kind of funding. But entrepreneurs are not the only winners. Investors also Enjoy taking part in ICOs for a variety of factors. This includes the opportunity to create enormous profits, which may be seen by the huge yields in 2016 from Monero and NEM start-ups. ICOs also offer greater liquidity, which isn’t readily accessible VC funding where exit options may be minimal. Here, profits could be pulled out easily by converting cryptocurrencies into Bitcoins or Ether, and then into fiat money. Platforms such as Coinbase, Kraken, Poloniex, and Yunbi allow investors to market their electronic riches and obtain quick returns on investments as costs vary drastically through the day. $25 million using its ICO. While the company had already raised $20 million from traditional VCs, additionally, it raised capital through tokens for its product Omise Go — a decentralized payment system that allows users to share money without having to deal with maintaining a bank account and incurring support or cross-border charges. Omise Go’s initial services will go live from Q4 of 2017, where nominal holders can earn money by being a part of the network. The ICO marketplace has grown at an exponential rate over the Past couple of months. The risk that this might be another bubble, like the dotcom Crash in 2000, has generated unease. Regulators particularly believe that such a highly open market is more likely to extreme volatility. It’s a dynamic place, where numerous tokens could be made and filtered out every day. Too much need by investors (due to speculation) can lead to tragedy. The rapid development Of ICOs as a source of financing is exciting but the sustainability of ICOs and Cryptocurrencies as a whole has yet to be proven. http://empirica-software.com/wp-content/uploads/sites/8/2019/02/Logo_empirica_software-for-financial-markets_final_big.png 0 0 hanifnezhad http://empirica-software.com/wp-content/uploads/sites/8/2019/02/Logo_empirica_software-for-financial-markets_final_big.png hanifnezhad2016-07-05 14:08:352017-12-05 16:17:07Are ICOs the new future of start-ups? While the High-Yield Bond transactions are settled in more than three days, the settlement interval for leveraged loans frequently extends to almost 20 days. This creates increased danger and a liquidity challenge from the leveraged loan market, hampering its growth and attractiveness. Since 2008, the global loan market has witnessed negative gain, whereas the High-Yield Bond market grew by 11 percent. We assume that smart contracts can reduce the delay in procedures such as documentation, buyer and vendor affirmation and assignment arrangement, and KYC, AML and FATCA checks, with the assistance of a permissioned ledger. With estimation that with the decrease in settlement times, if the rise of loans may be at least half that of their High-Yield Bond market growth (i.e. between 5 percent and 6%), it would amount to an additional $149 billion of loan demand on the industry. Such loans generally carry 1% to 5% of fees, translating into extra income of $1.5 billion to $7.4 billion to investment banks. In addition, operational expenses, regulatory capital requirements and costs related to delayed compensation payments throughout the settlement of leveraged loans will probably be decreased together with the shortening of the settlement cycle. Read more about basic idea behind Ethereum and Smart Contracts here. The mortgage loan process is dependent upon a intricate ecosystem for the origination, financing, and servicing of the mortgages, including costs and delays. Smart contracts could reduce the price and time involved in this process through automation, process redesign, shared access to electronic versions of bodily legal documents between trusted parties, and access to external sources of information such as land records. Our earlier study on banks back-office automation suggests that mortgage lenders may expect savings between 6 percent and 15% from business $149 billion added leveraged loan volume increase with a reduction in settlement times 11 client fills mortgage application with earnings, taxation and property details Are property documents valid and lien status in order? Reject loan application and inform the client credit mortgage accounts article verification of earlier measures calculation of the cost savings possible from the usage of smart contracts in the US mortgage sector register bank’s lien on land signatures confirmed and mortgage accounts generated customer signs the mortgage document in addition to the witness mortgage record created approved rejected credit history id check KYC & AML check check income and land LTV reject program and notify the customer mortgage adviser creates loan workflow and updates credit, id, KYC, AML information in bank’s loan workflow for mortgage origination predicated on sale of 6.1 million houses of which 64% are being marketed on mortgage mortgage loan origination cost for an average loan of $200,000 in the US (2015), minimum savings US$ 4,349.5 17 billion 396.3 (9.1%) 1.5 billion 1,528.4 (35.1%) 6 billion. These numbers, coupled with our experience and discussions with industry experts, helped us estimate anticipated savings for each of the processes involved in loan origination. For example, in the US housing market, almost 6.1 million homes were sold in 2015. Based on historical averages, 64 percent of them were bought by home owners with a mortgage. We estimate that minimal savings of $1.5 billion could be achieved by loan providers through the automation of tasks in their organizations. Further, economies of $6 billion could be achieved once external partners such as credit scoring companies, land registry offices, and tax authorities become accessible over a blockchain to facilitate faster processing and reducing costs. We also estimate that loan clients could expect a 11% To 22% drop in the entire price of mortgage processing fees billed to them if smart contracts are adopted. The total of outstanding mortgage loans across the united states and European Union countries in 2014 was valued at $20.98 trillion. Based on the US mortgage market case, smart contracts may possibly save between $3 billion and $11 billion in the new mortgage origination process across the US and EU. We consider that, in the motor vehicle insurance industry, smart Contracts that bring insurers, clients and third parties to a single platform Also, third-parties like chargers, transport providers and hospitals — once They are part of the dispersed ledger — will be able to supply faster Support against promises to clients and can anticipate quicker settlement of claims. The united kingdom motor insurance industry dropped 3.7 million claims and spent $13.3 Billion in claim expenses and costs. We calculate that roughly $1.67 Billion, or 12.5 percent of their overall costs, might be saved by adopting smart contracts. Dependent on the United Kingdom motor insurance market, we estimate that each year $21 billion could be spared from the global motor insurance industry via the Usage of smart contracts. A portion of savings can be passed on to the Clients via reduced premiums on motor insurance policies. We estimate that the Cost savings amounts to a reduction of $90 on average on each premium payment In the event the insurers pass on each of the savings generated from smart contracts Adoption to customers, and $45 per premium in the event the insurers decide to pass On only 50 percent of economies. 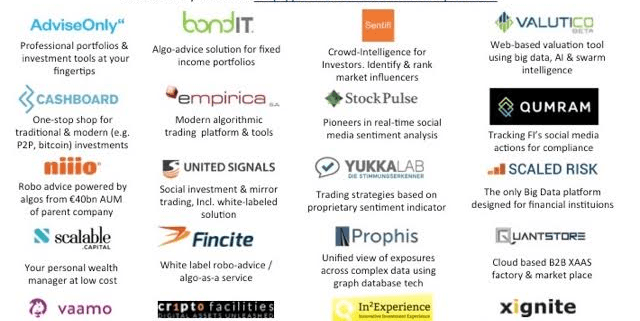 http://empirica-software.com/wp-content/uploads/sites/8/2015/10/CanaryWharf-FinTech-1030x602.jpg 602 1030 empirica http://empirica-software.com/wp-content/uploads/sites/8/2019/02/Logo_empirica_software-for-financial-markets_final_big.png empirica2015-10-02 20:50:242016-10-03 14:31:53Who is moving FinTech forward in continental Europe? Thoughts after FinTech Forum on Tour.